The ballast worked out. Now what? 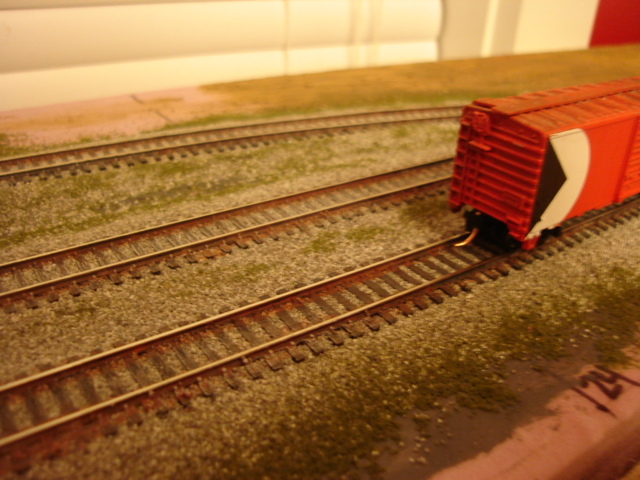 For the most part the ballast work is now done. 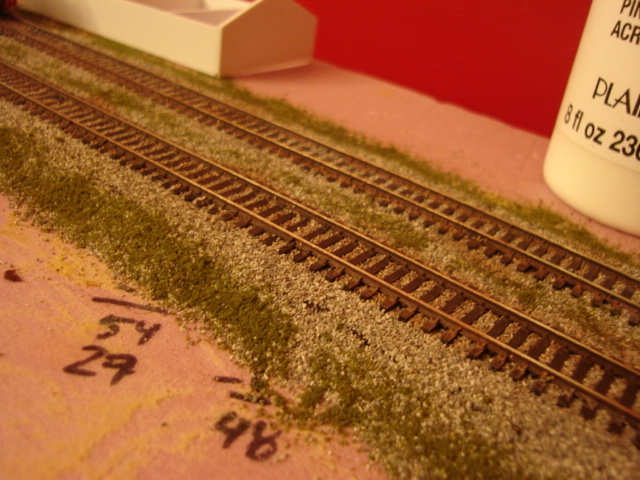 I had a lot of self-doubt when I started ballasting and I’m ever so pleased that things are working out, even more that everything is still nicely stuck in place. In fact, thanks to a lot of patience and care I think this might be some of the nicest ballast work I’ve ever completed. Before I started ballasting, I painted and weathered the track with some coloured washes and with the ballast now stuck in place, I figured I’d have a go at weathering the trackwork. I was also hoping to arrive a colour range that looked a little bit rusty but not too redish. I like the effect so far. Just as I was wrapping up I figured I’d try picking out some of the ties with some greyish tones. Unfortunately this colour wound up on a few tieplates and rail and I’ll need to correct that. As pleased as I am with the ballast on the main module, I wish I had noticed that I hadn’t done any weathering of the ties and rails before ballasting the second module. I had sprayed some colour onto the ties and rails so at least I’d made a start. Unfortunately there is a stronger contrast between the dark brown and monochromatic ties and rails compared to the lighter grey ballast. I’ve started experimenting with some subtle washes and dry brush work to try and soften the look. The above photo shows things as they are now. Throughout this project I’ve remarked on how pleased I am with how things are progressing. It’s been a really long time since I’ve done any of this kind of work and it’s fun to re-introduce myself to things I remember doing before. It’s terrific to have a generic layout underway to act as a place to play around with everything. More than anything I would or wouldn’t do again in the future, having a space like the one this layout provides is something I hope I’ll always have access to. That’s some fine looking track and roadbed! Thanks, Steve. I’ve been looking at these photos and it’s remarkable to compare them to the actual layout. I see things in the photos that I just don’t see on the real layout in terms of colour and a few stray grains of ballast I swore I had cleared. Thanks, Tom. I’m just as keen to see what’s next. I know that I liked the track plan but typically by now my attention has wandered and I’ve started something new. Yup. Just about exactly like that. Berlin suburban railways anyone? 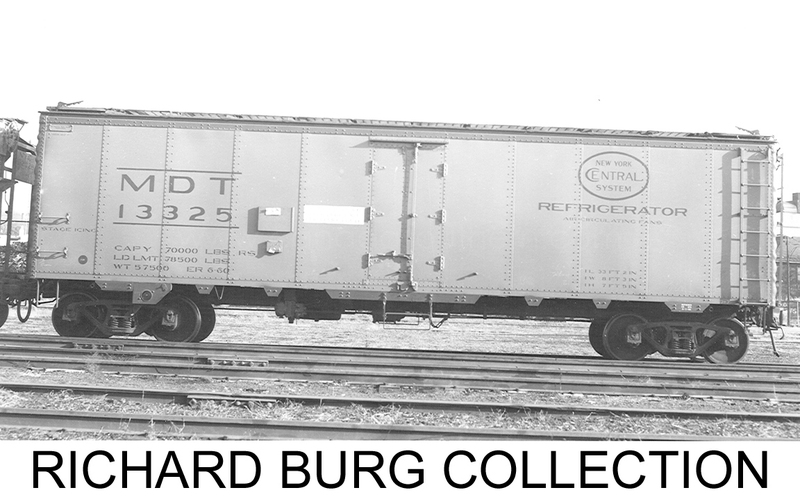 Some industrial tram in 1/35? Forge ahead Chris. There’s nothing in this work that can’t fixed if needed. Sage words indeed. Thanks, Mike. I expect to do many parts of this layout over as skills improve keeping the current project from getting stale – a living layout. Track looks good, Chris. Now what? Run them trains! I couldn’t agree more. I’ve already run one session. With temperatures rising inside and out I actually have one rail joint where track has expanded and this will require some correction. Be on lookout for sun kinks in rail and do not exceed fifteen 15 miles per hour when temperature is above….. I can see the train order being written now. 15mph is about typical speed so the crews might not even notice. I do like the TO idea. Better get that order started.